If you've been following for any period of time you may have noticed I have a thing for Jarrah. Jarrah is a dense, rich, red west Australian timber, that's practically indestructable and looks really beautiful. 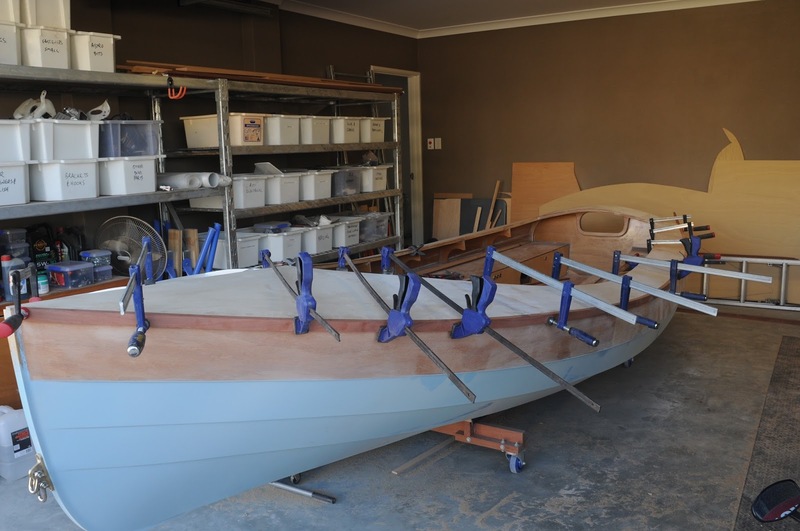 I've done my transom in Jarrah, I've done my rowing thwart in Jarrah, and I'm using it in my mast. I really love the stuff, because it's quintessentially WA. So, Gunnels. What better timber to mount your guns to than a length of lovely strong rich Jarrah. Easy! Off I went and bought some lengths, in 19x40, reasonably close to the 20x40 recommended by the erstwhile John Welsford. Did I mention that Jarrah is tough, and dense, and strong? Oh, I already did, didn't I. Well, you can add stiff to that. I joined bits to make a 5m long length and tried bending it onto the boat. No way! So then after I got over myself I tried with some Jarrah of slightly less heroic proportions - some 12x30 that I've bought for the mast. Easy peasy, but it looked a little wimpy. 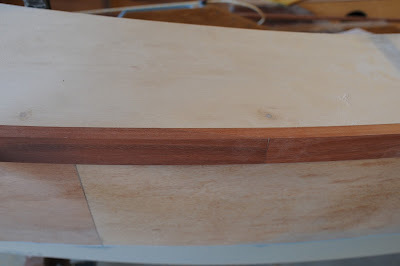 The hardest bit was the stern, doing the upwards bend, not the inwards bend at the bow. Stiffness increases with the third power of depth, so the change from 40 to 30mm dramatically influences the stiffness. So I knocked my 19x40 down to 16x32, and tried again. Bloody hard work, but it went. Here's a photo of the first test-fit. I have to cut the bow end nicely and wait for more goop to arrive before I put it on properly. 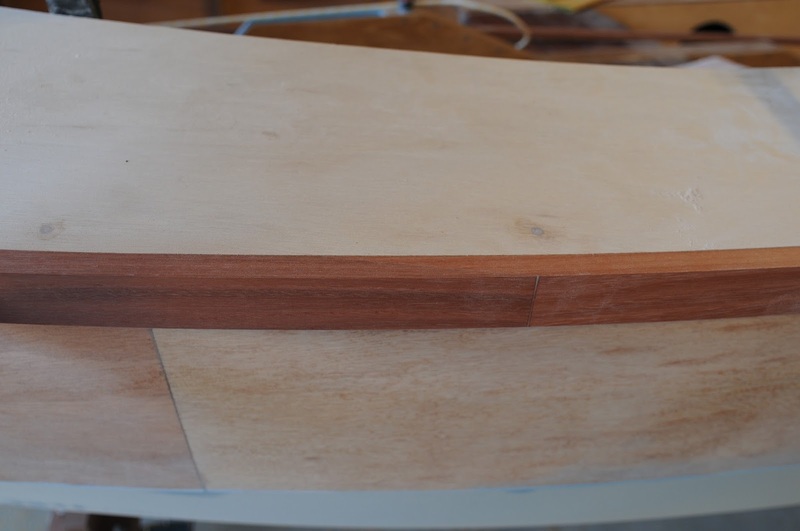 Here's the join - knocking the length down from 19x40 to 16x32 made my join all but disappear.